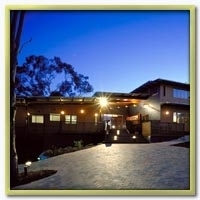 Leatherwood Lodge is luxury Brisbane accommodation uniquely situated on acreage just a twenty minute drive from the city centre in the beautiful Brookfield valley. The award winning, architect designed Lodge is sited on a high ridge with stunning 360 degree views. The four luxurious guest rooms are individually furnished in the Biedermeier style with exquisite French and English fabrics, complemented by elegant bathrooms. Original works by Australian artists are a particular feature of Leatherwood Lodge. The level of guest comfort is optimisd by fully integrated and individually controlled air conditioning. Each of the guestrooms open onto a wide and protected verandah with panoramic views of the city and rural valley. The use of outdoor verandah rooms is a feature of this contemporary country lodge and optimises the choice of relaxing places for guests to unwind. 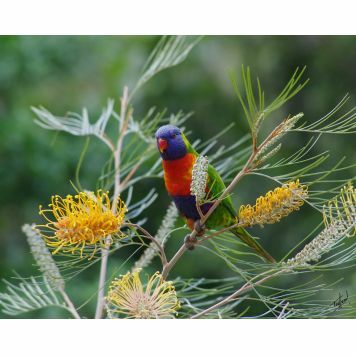 The various guest areas provide immediate access to the extensive native gardens, with their abundant birdlife and the occasional kangaroo. The grounds include a beautifully sited resort-style saltwater swimming pool which similarly has city and valley views. Guests enjoy free wifi and complimentary undercover carparking. Minimum 2 nights stay or 2 rooms for one night. Special package for Bridal parties. Enjoy the special features of the lodge. Please feel free to contact us to discuss your special needs. Deluxe queen suite with en suite opening onto a verandah with extensive views. Luxuriously appointed with Biedermeier style furniture and imported fabrics. Split system reverse cycle airconditioning for all year comfort. Flat screen Samsung TV and DVD player as well as Digital Radio with IPad, IPhone and IPod dock. Complimentary soft drinks and tea and coffee making facilities provided with a gourmet continental breakfast included in the rate. Check in after 1pm. Check out 10am. Range of restaurants at nearby Kenmore with award winning establishments only a short drive away. Situated in a unique rural valley with its own village. Local showground hosts a showcase agricultural show during May. Nearby equestrian facility offers horse riding lessons.